10 Opal Wedding Rings We’d Gladly Wear Instead of the Classic Band! 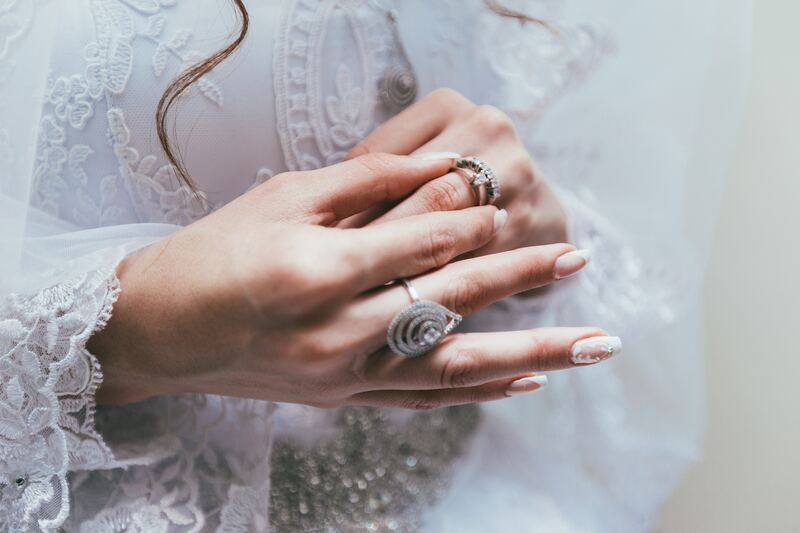 Weddings can be extremely stressful because there are so many things to think about – the venue, the dress, the cake and most importantly, the wedding ring. You may like the idea of wearing a classic band, or you may prefer wearing a gemstone wedding ring. If this is the case we’ve selected our top ten list of the best opal wedding rings that you could choose for your big day! Our list means that not only will you have one less thing to worry about, but you can also tick another thing off your wedding ‘To do’ list! When it comes to opal gemstones, there are a variety of colors to choose from including white, blue, yellow, green, orange, red and violet. For our top 10 we’ve decided to narrow it down to the white opal wedding ring because we love it so much! The ‘white opal’ or ‘light opal’ gets its name from having a milky or white base color. When viewing the while opal from a different angle you’ll notice that it will appear to be a rainbow-like color. This is due to the ‘play of the color’ which we’ll explain later on. 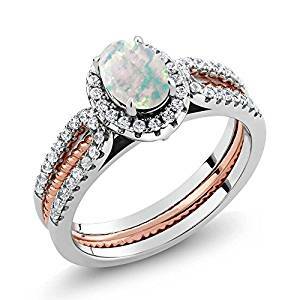 When wearing your opal ring, you’ll notice that when you view it from a different angle the color of the gem may change slightly, giving you a gemstone that continually changes color! The white opal can be found in South Australia, in particular from Coober Pedy. There’s also a common myth that the white opal is the only opal available to buy, however this isn’t the case. This myth may have started as a result of the white opal’s growing popularity and the number of white opals produced. There are three different types of opals to be aware of – the precious opal, the common opal and the fire opal. (In case you didn’t know the white opal is classed as a precious opal). Precious opal – When placed under a light source the precious opal displays a “play-of-color”. This means when the light enters the opal it causes the stone to give off a flash of spectral colors. This is why the appearance of a precious opal continually changes when it is placed under light or when the light source moves. When the angle of observation changes, this also causes the color to change. Common opal – A common opal does not display a “play-of-color” and does not have a background color. The name of the common opal is said to come from the fact that it can be found in a range of locations across the globe. Common opals have also been known to be referred to as a ‘potch’ by gemmologists and jewelers. Fire opal – This is known for having a solid body color which is bright red, bright yellow or bright orange. This stone is not known for being flashy but having a “background color” makes it a fire stone. Unsurprisingly, the fire opal gets its name from the fiery color it embodies. This type of opal is sometimes referred to as a Mexican opal. The opal gemstone is not only a beautiful gemstone, but it’s also said to have a range of healing qualities. It’s known to help depression and help a person to find true love (so you’ll certainly be getting your money’s worth!). The stone can also stimulate creativity and originality. Interestingly, the opal is quite absorbent (in other words it’s known as being porous) and it is this quality that makes the stone amplify emotions and pick up feelings and thoughts. There are no exceptions when it comes to Hollywood’s leading ladies and their love of opal rings. 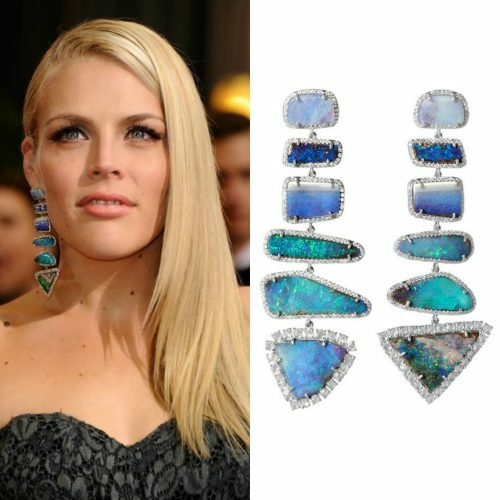 Claire Danes, Taylor Swift, Michelle Monaghan, Busy Phillips, Cate Blanchett and Jennifer Hudson are just some of the female celebrities who are often seen fashioning gorgeous opal jewelry. Throughout history there have been a number of iconic celebrities whose love for opal has stretched to the moon and back. Take for instance Elizabeth Taylor and her love for Australian opals. She was famous for having a huge collection of jewelry, many of which included opals. The king of music, Elvis Presley was another iconic celebrity who loved his opal jewelry. He was famously known for wearing a 14k vintage opal ring with 1.25ct of diamonds on his pinkie finger. And perhaps the most well known lover of opals, Queen Elizabeth II famously wears the finest opal jewelry in the world, in particular her opal necklace which is an 18 carat palladium necklet. It weighs 203 carats and included a variety of magnificent colors including green, blue and red. Queen Elizabeth II isn’t the first royal to favour opals and even Queen Cleopatra VII of Egypt (30-69BC) loved her opal ring! So now you’ve learned the basics about opal gemstones, you’re ready to take a look at our list of stunning opal wedding rings. 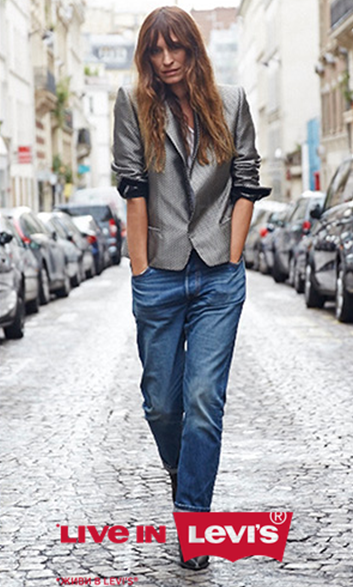 We’re sure that you’ll find something that you can wear on the big day! 10 opal wedding rings which you won’t be able to get your hands off! If you want a ring that shimmers all day and all night then look no further than this halo opal ring. What makes this ring unforgettable is the eye catching multicolor gemstone in the center of the ring. A collection of 72 white cubic zirconia diamonds surround the gemstone beautifully. The halo opal center definitely makes the piece a statement piece and this continues along the metal band which works effortlessly in sparkling like the stars in the sky. Between the opal gem and the sparkling diamonds, this attractive duo creates a classic feel for this piece. This ring would certainly make a great wedding ring particularly because the endless shimmer and sparkle of the ring would brighten up your finger, whether it’s worn on its own or alongside an engagement ring. The supplier for this opal ring is PEORA. If you take a look at their website you’ll notice that they specialize in making a variety of beautiful gemstone jewelry. 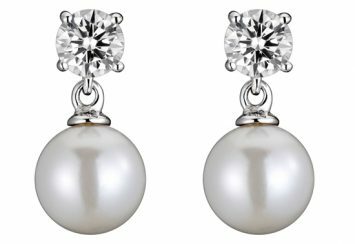 Whether its earrings, pendants, bracelets, necklaces or rings – they have something to offer! They also specialize in creating stunning gemstone jewelry. 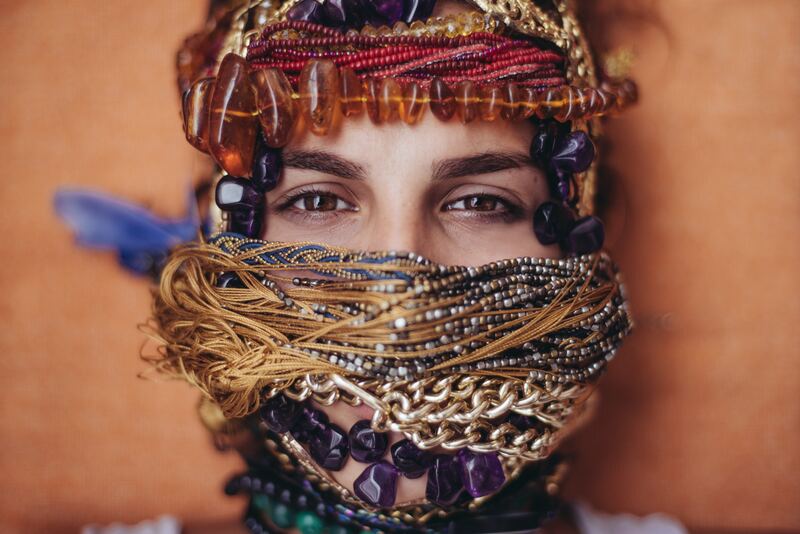 If you have a particular color in mind or want to wear a piece of jewelry to represent your birthstone, PEORA are the people to create it for you! This three stone solitaire ring is a great way to wear your opal stone. 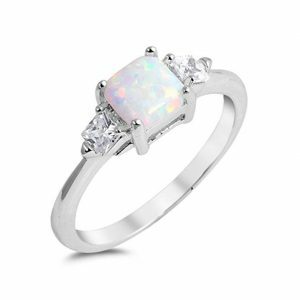 Consisting of an opal princess cut, this white opal gem is set between two smaller cubic-zirconia colorless stones along a sterling silver band. We think this solitaire style ring would look great alongside a plain band, but whether you wear the ring on its own or with another ring one thing’s for sure. This white colored opal is very bright and very beautiful! 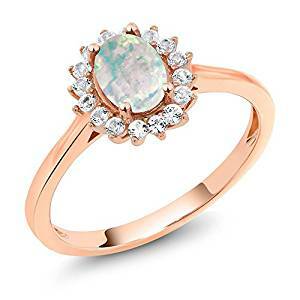 If you want to change the color of your metal the supplier gives you the option of ordering your opal ring in a rose, black gold or yellow plated metal, so there’s even the option to tailor the piece to your taste. The supplier, Blue Apple Co, is known for creating gorgeous rings, earrings, bracelets, all of which showcase beautiful gemstones. Take a look and see which piece takes your fancy! What makes this opal ring unique is the two-tone sterling silver design. A rose gold band is positioned between the two sides of the sterling silver band, creating a unique and mesmerizing design. The rose gold effortlessly makes the band and opal stand out. 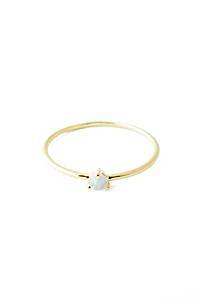 Classic, simple and elegant, this truly is a gorgeous opal ring! Founded in 1903, supplier, Gem Stone King, specializes in fine gemstones and jewelry. They pride themselves in delivering the highest quality of fine jewelry for good value. Their collection consists of bracelets, engagement rings, pendants, and earrings, all of which are available in a variety of stones and colors. 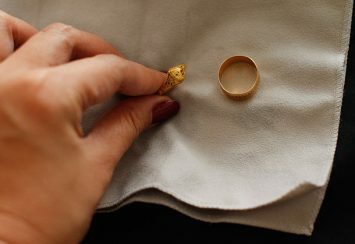 The supplier goes the extra mile by suggesting how to best look after your piece, offering tips such as not wearing your ring in water, keeping it away from perfumes and lotions and cleaning your ring in warm soapy water. Another thing we love about this piece is that it arrives in gorgeous packaging ranging from cardboard boxes to sleek cherry wood boxes. This bridal set really is eye catching! 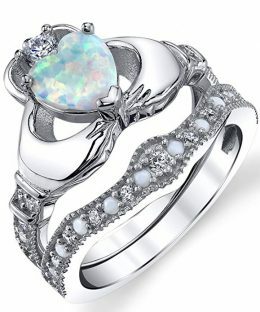 Consisting of a heart shaped claddagh ring and bridal band, this ring includes a simulated opal as the centerpiece with a clear cubic zirconia within the crown of the ring. These rings are quite large so are perfect if you’re looking for a chunkier ring and statement piece of jewelry. The company that makes these rings, Metal Masters Co, say that these rings are inspired by the Irish symbol that represents loyalty, love and friendship. How romantic! Claddagh rings traditionally contain hands to represent friendship, a heart to show love; and a crown to show loyalty. This ring offers all of the features of a traditional claddagh ring, with a beautiful simulated opal as the cherry on top! We love the look of this piece. Not only does it stand out on the finger, but it’s also very pretty and contains an impressive level of detail. You get a lot for your money with these pieces, with both rings being rhodium plated and being delivered to you in a free ring box, so you can keep the rings safe until your big day! 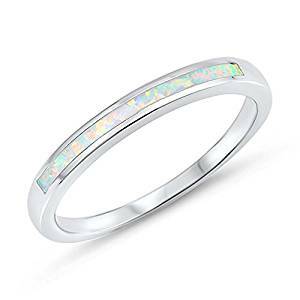 Created by Sac Silver, this opal band is a wonderful sterling silver wedding ring. Colors include blue simulated opal, light blue simulated opal and white simulated opal. The sterling silver band is mixed with alloys to strengthen the ring and make it more durable so it will be nice and strong! The band is also perfect if you would like to stack your rings. This is definitely a cute, delicate and very subtle piece which we love! It would complement a more prominent stand along opal engagement ring very well. This is a very reasonably low priced ring so if you’re on a strict budget this is a great option. The supplier, Sac Silver, offers thousands of different styles of jewelry. One thing for sure is that they’re dedicated to creating jewelry with plenty of personality. Again, PEORA has created another shimmering ring! The design will take your breath away. With the opal gemstone in the center and one stone either side of the gem, the three stone ring setting looks beautiful. The opal is also 8mm in diameter, making this an impressive size. The two stones either side of the opal are made from white cubic zirconia which is super sparkly. To finish it off the band has been crafted from rhodium plated sterling silver. 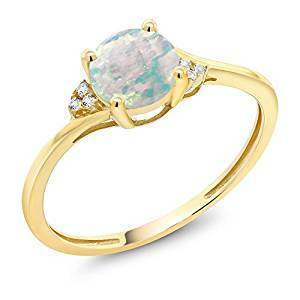 Overall this opal ring is very pretty, the setting is lovely and the ring is very affordable – what’s not to love! This piece would make the perfect birthday present for your mum, daughter, girlfriend or wife and has been cleverly crafted by PEORA who also sell a fabulous collection of jewelry including rings, earrings and necklaces. Specializing in gemstones this company really know how to create special gemstone jewelry. What makes this ring unique is its twisted style band that shimmers with cubic zirconia gems. In addition to the setting of the gem, the opal gemstone and the cubic zirconia which frame the gem make a big statement in this piece of jewelry. When worn out in the sun, the opal gem looks amazingly bright and accompanied with the diamonds, the entire ring really does sparkle. 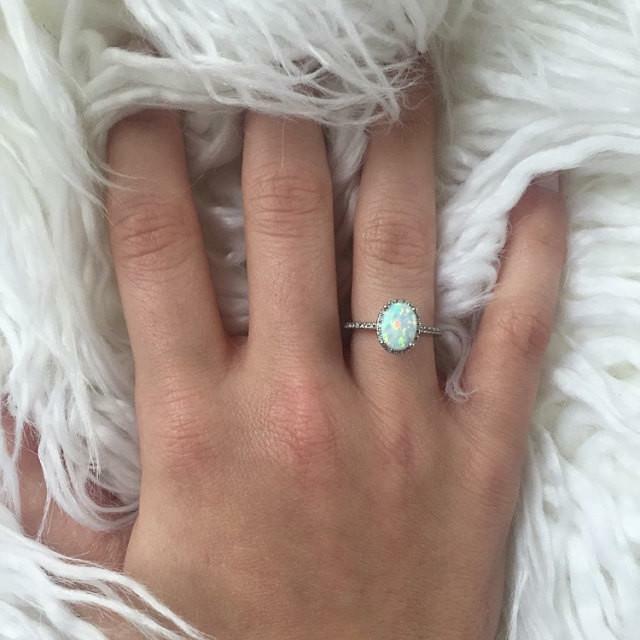 This opal ring is flawless! The supplier, Oxford Diamonds, has done a wonderful job with designing and crafting this piece. 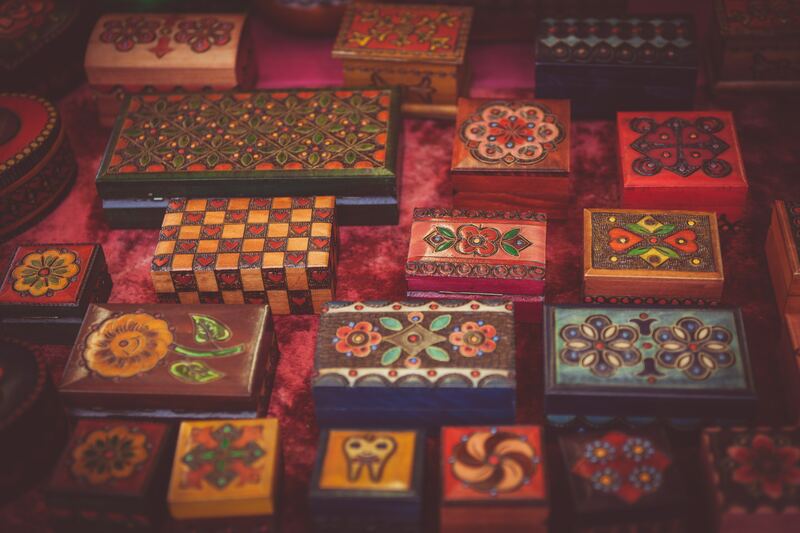 Looking closer at their collection, they make a variety of jewellery including rings, pendants, earrings and charms, many containing gorgeous gemstones. We’d also recommend having a browse of their wider collection! If you’re fond of rose gold jewelry and love flowers then this ring may just be the ring for you! Made from solid 10k rose gold, this ring contains an opal stone in the center of the ring and white sapphire diamonds around the edge, looking similar to that of a flower. Even though we love the flower design it is important to point out that the band is very thin. This band does compliment the flower and overall dainty look of the piece but it may be uncomfortable for some people to wear. This particular design does however work well in accentuating your fingers. 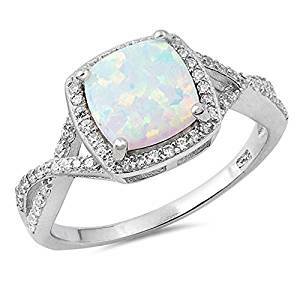 We think this design makes it a very modern and sleek opal ring! It has been created by specialized jewelry maker Gem Stone King who has been making diamond and gemstone jewelry since 1903. They offer a variety of high quality jewelry including bracelets, earrings, engagement rings and pendants, all available in different stones and colors. The supplier is also known for creating pieces of jewelry with exceptional brilliance and shine. We love that this piece is very delicate, beautiful and feminine. Delicate and petite would best describe this opal piece. The brass plated band with 24k gold contains a small round opal crystal along the thin, dainty gold band. The opal also has a rainbow-like color within the gemstone. What makes it even better is that it looks like it costs much more than it actually is! If you don’t like yellow gold, it is also available in sterling silver and 18k rose gold so you have plenty of options to choose from. The supplier, HONEYCAT, is known for making simple and classic jewelry at an affordable price. They craft gorgeous pieces of jewelry including earrings, rings, pendants and necklaces made from silver, rhodium, 18k rose gold and 24k gold. 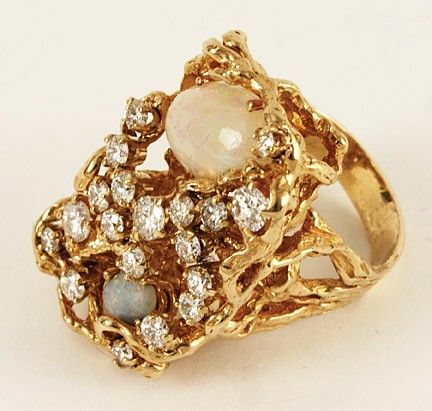 This 10k yellow gold diamond ring with white opal is definitely something special to shout about. If you were lucky enough to receive this as a wedding piece, you’d definitely be happy with your purchase! Made from 10k yellow gold, the setting of this gemstone and single cut diamonds that are positioned either side of this gem work well in framing the gemstone in the center of the ring. Gem Stone King has beautifully crafted this piece using only the best gemstones and metals. They pride themselves as being one of the leading online jewelry retailers and in particular focus on making bracelets, engagement rings, pendants and bracelets. Effortlessly pretty, we’d definitely give this ring a big thumbs up! Where to opals come from? Australia produces around 97% of the entire world’s supply of gemstones. In particular, the opal can be found in South Australia at Andamooka and Coober Pedy as well as in New South Wales at White Cliffs and Lightning Ridge. What’s the best way to clean my opal ring? Before cleaning your opal ring, the first thing you need to do is be certain about the type of opal ring you have because this will affect your cleaning method. You’ll need to establish whether the opal is a solid opal or whether it’s made from layers. If it’s made from layers it could be called either a doublet or triplet opal. 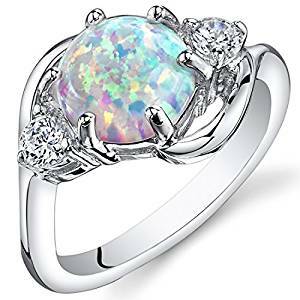 If you’re not made aware of this upon purchasing your opal ring, the supplier should be able to tell you post purchase. Put a half cup of warm water into a bowl. Make sure that the water is warm and not cold or hot because these temperatures can create cracks in your opal. Next add two or three drops of unscented, mild dish soap, creating a lather consistency. Pure opals – place your opal in the cleaning solution for a couple of seconds and then swish it around until you remove all of the surface dirt. Remember to rinse your opal straight away so no soap remains lefts on the opal. Doublet and triplet opals – these should be cleaned carefully using a microfiber jewelry cloth. Place some cleaning solution on the cloth and apply to it to the opal. Then rinse the opal carefully by wiping it with a jewelry cloth. Next dry your opal using a very soft cloth or using a microfiber cloth. Make sure it’s completely dry because water can damage the opal gemstone. Finally, make sure you clean the rest of ring using a soft toothbrush but be sure to avoid cleaning the surface of the opal. Try to clean your opal ring once every two months. This will help prevent a build up in dirt and skin oils. It will also make the actual cleaning process a lot easier each month because there will be less dirt to clean. If it is still looking dull after you have cleaned it, this may be because it has been scratched. If this is the case then you’ll need to take it to a jeweler to be polished. They may need to repair a crack or scratch. Do not place your opal jewelry in an ultrasonic cleaner because the vibration may crack the stone. The cleaning solutions in the cleaner could also damage the opal. As already advised, it’s important to use soap and water instead of any traditional cleaning solutions. How do I best care for my opal ring? 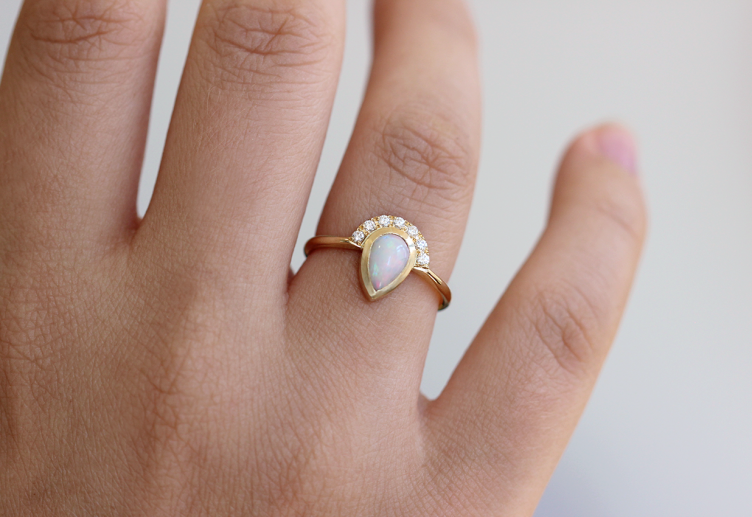 You can best care for your opal ring by storing it in the correct way and being careful when you wear it. We’ve included some useful tips below that will help with this! 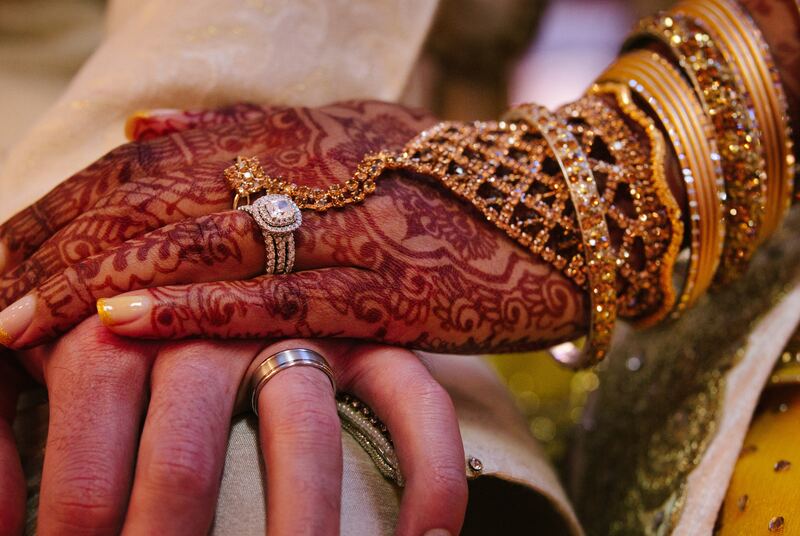 Storing – Make sure you avoid placing your ring in a place where the temperature can change dramatically. You can also protect your ring by keeping it away from dry areas. 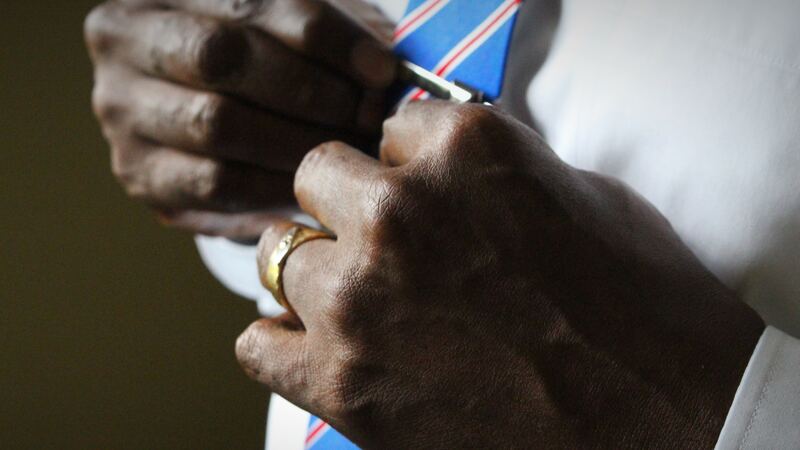 If possible, wrap your ring in a piece of cloth that has been sprinkled with some water and place it in a plastic bag. You may like to store your opal with other pieces of jewelry so our tip is to wrap the opal ring in some fabric to avoid any scratches. Wearing – Be careful when you go from being in cold place to an extremely warm place because opals can crack when they are exposed to an extreme change in temperature. It’s important to avoid allowing your ring to come into contact with very cold water or very hot water. We’d suggest you removing your ring if this is the case. Also before applying any lotions or soaps as products like this can cause your opal ring to become dull in shine and will result in you having to clean your ring more! Are there any colors other than the white opal? Yes, there are a variety of different colored opals. White, blue, yellow and green are the most common colors. 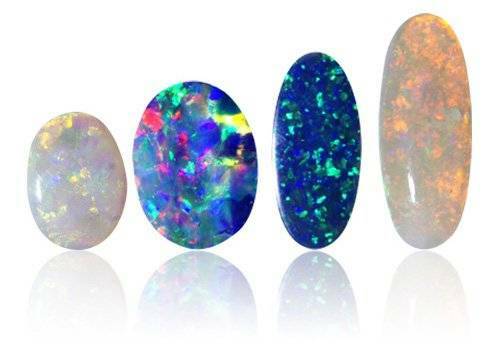 Whereas orange, red and violet are the rarest colors that you can get for an opal gemstone. 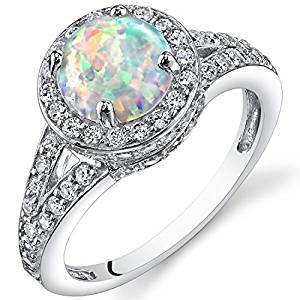 How much should I spend on an opal ring? The amount of money you spend on an opal ring really depends on the budget you have and how much you like the ring! A few things that do define the value of the opal are the play-of-color, the saturation of body color and the transparency. All of these factors will influence the price of an opal ring so it’s important to do your research.